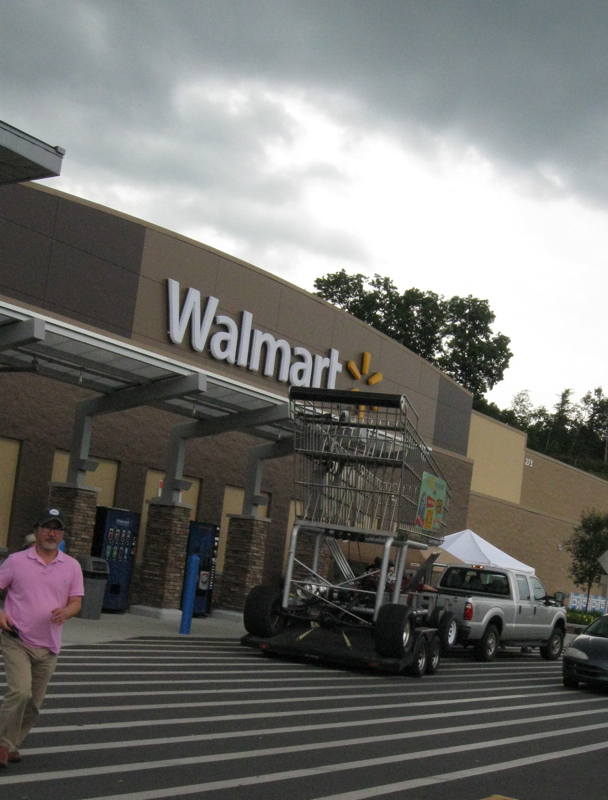 We pulled into a Walmart parking lot in Franklin, North Carolina, with plans to stock up on food and other camping supplies before we made the last leg of our journey to our Smoky Mountain campsite. Dark clouds started leaking giant plops of rain on our van. But what caught my attention was a giant grocery cart on a trailer. A pickup truck was maneuvering the trailer into position along the sidewalk in front of the store. When I exited Walmart later, the 13’x15’ cart was off the trailer and lurking beside the store’s exit. I wanted more photos and the story behind the supersized, motorized shopping cart. But rain was threatening once again. Husband Walter was ready to roll. And both of us wanted to make it over the mountains in time to set up our popup camper before dark. I only managed to snap the photo at the top of this post. But once back home I googled. The Big Cart page of the Got to be NC website described the cart as a promotional vehicle, powered by a Chevrolet 396 V-8 engine and rolling across North Carolina since 2006 as part of the North Carolina Department of Agriculture’s “Got to Be NC” campaign. The marketing effort promotes the agricultural products produced and processed in North Carolina. In the photo above, the driver in the "kiddie" seat is NOT my husband, but from the perspective of the image I borrowed off the Big Cart page, the driver does look a lot like my hubby. 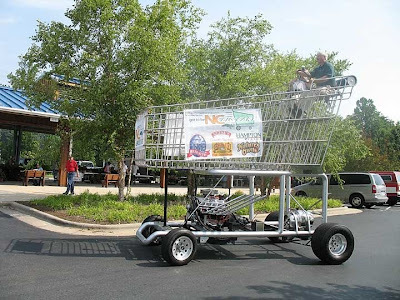 A calendar of the cart’s appearances at businesses and festivals showed a schedule booked solid for August 2013 and busy through the end of 2013. The cart must be a popular novelty. I learned from the Internet search that individuals and organizations in other states and countries also boast huge motorized shopping carts. When I’m going down the Google highway,why do I become so engrossed in exploring a multitude of ever smaller and more remote pathways then feeling compelled to share every morsel of trivia that I encounter? Now that is weird. Can't wait to see the footage when they have Big Cart races. Never seen anything like that in my entire life... Lol. Love the prayer. I'm afraid that is my prayer more often than not. 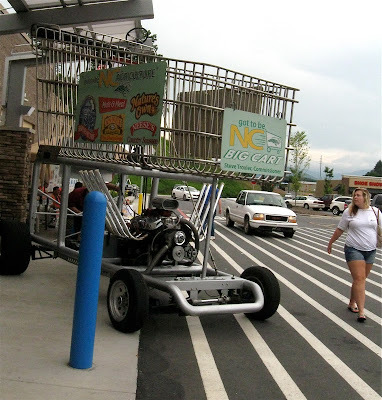 Love the motorized shopping cart and especially the shot of the man driving it. It's such a funny perspective. I'm sure there were double takes. Reading about your trip sure makes me antsy for an escape somewhere. I have just told myself not to post ANY comment on Facebook for at least a week. Then I find something I just have to share and off I go! We have too much information out there that's just screaming to be shared.